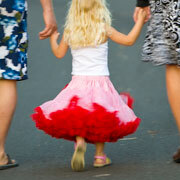 This BooTiqueBaby Pettiskirt is absolutely gorgeous. This will turn heads. It has layer upon layer upon layer of soft full nylon chiffon.